CEDAR CITY — Canyon View High senior Brantzen Blackner has signed a letter of intent to play basketball for Snow College starting this fall. Blackner signed the letter in the school’s library Friday morning in front of a crowd of more than 100 people, including many friends and family members. 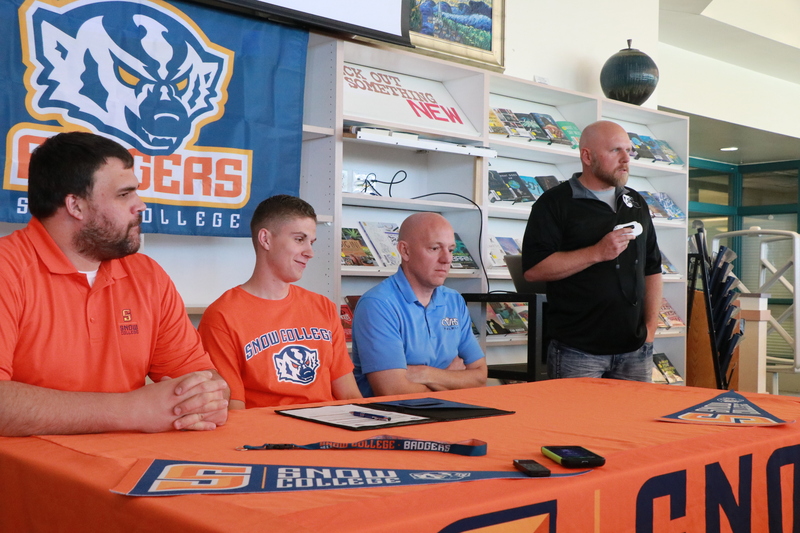 During the half-hour ceremonial signing event, Blackner was flanked by his high school coach, Rob Potter, and Snow College assistant coach Ben Cruickshank, both of whom spoke highly of Blackner and his impact on and off the court. 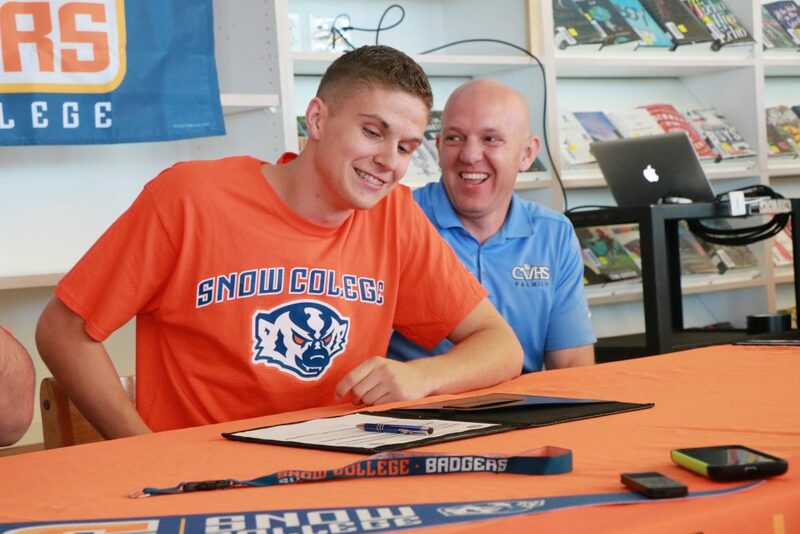 Cruickshank, who is in his first year coaching at the university, said: “Brantzen’s actually the first kid I’ve ever been assigned to recruit at Snow College. And I honestly couldn’t be happier about it. As a coach, there’s some things we look for in kids. In our culture, in our program, it’s just as important about the kind of person they’re going to be off the court and in our community. Blackner, who plans to study exercise science and sports medicine in college, said he’s excited to play for the Badgers next year. After thanking his family, friends and fans for their ongoing support, Blackner said, “I’d like to thank coach Ben for believing in me and for reaching out to me and recruiting me and making me feel wanted and being a part of their program and also (head) coach (Robert) Nielson, who’s not here with us today. I’m excited. It’s a great opportunity and I’m looking forward to it. Potter said Snow College will be a great fit for Blackner. During the 2017-18 season, Blackner’s senior year, he averaged 20 points and 8 rebounds per game, second among all Region 9 players in both categories. His highest scoring game was 35 points against Carbon on Dec. 28. Blackner also led the region with 3.0 steals per game and was second-best in the region with 58 3-pointers made during the 2017-18 season. Canyon View baseball pitcher Trace Harden signed last fall to play baseball for Eastern Arizona Junior College. Pua Johnson, a first baseman for the Cedar Lady Reds, recently signed to play softball for Southern Virginia University. Her senior teammate, shortstop Dream Weaver has signed to play softball for the Southern Utah University Thunderbirds. In addition, Trenton Mauer, who throws javelin for Cedar’s boys track team, has signed to join SUU’s track team in the fall. Also for Cedar, soccer players Julia Hunt and Rachel Hunt signed to play soccer for Snow College. The sisters scored a combined 13 goals their senior season, helping the Lady Reds to an 8-4 region record. Hurdler Carter Reynolds has signed on with Weber State University’s track team. Dixie High’s Tyson Fisher has signed to bring his considerable baseball talents to Dixie State University. The versatile Fisher is among the region leaders in both pitching and hitting. He has a current batting average of .506 and is 6-0 as a pitcher in region games this year, with an ERA of 0.38. Meanwhile, senior teammate Hobbs Nyberg is still undecided on his college choice but is expected to make an announcement soon. 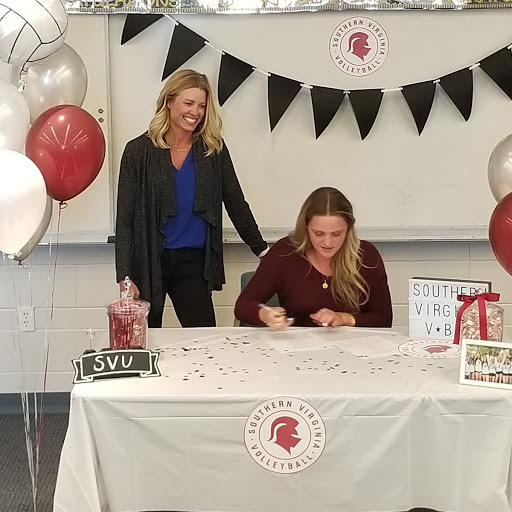 Also for Dixie, Ella Burrows has signed to play volleyball for Southern Virginia University. Dawn Mead has signed to play basketball for Southern Virginia, while Claire Newby, a fellow guard on the Lady Panthers, will play basketball for Snow College. Softball player Sydney McArthur has signed with McCook Community College in Nebraska. In addition, distance runner Jacey Finch has signed to run cross-country for the Lady Thunderbirds at SUU. Snow Canyon’s Josh Sodorff has signed to play tennis for Hastings College in Nebraska. 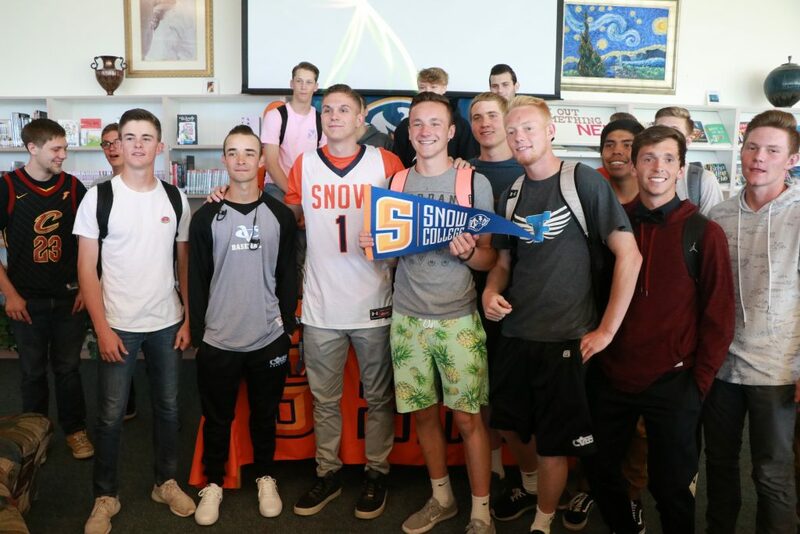 Also for Snow Canyon, baseball player Austin Deming has signed to play for Brigham Young University, and ace pitcher Breck Eichelberger will play for the University of San Francisco. Their teammate, Jed Jensen, is reportedly still deciding among multiple offers. In addition, Keivontae “Tae” Washington of Snow Canyon recently signed to run track for Utah State University. Snow Canyon’s Lexi Hamel has also signed to play golf for Southern Utah University. 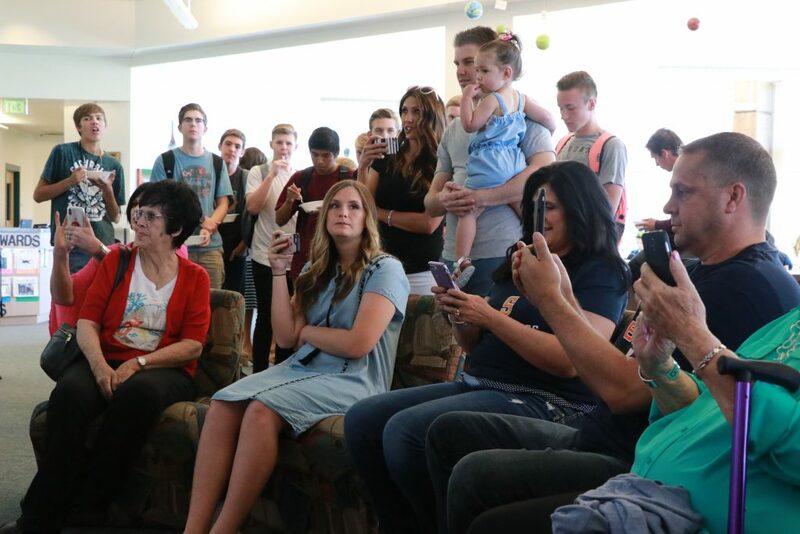 St. George News compiled the names in this story using information supplied by athletic directors and other school officials. 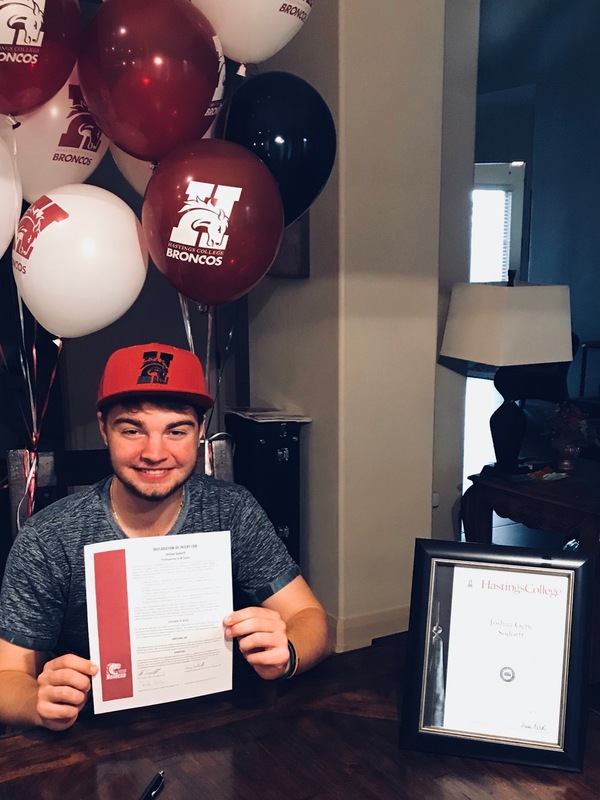 If there are other Region 9 signees for college athletics not mentioned in this story or in previous coverage, please email St. George News sports desk at sports@stgnews.com. Sports editor Andy Griffin also contributed to this article.